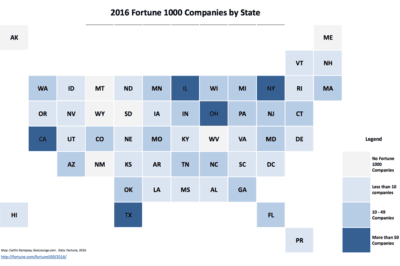 This article takes a look at the geographic distribution of Fortune 1000 companies within the United States for 2016. Table of Fortune 1000 companies for 2014 which can be filtered by state. The list can also be sorted by company name, 2014 rank, 2013 rank. The list also shows the CEO name, city, ZIP Code, and state.